WASHINGTON — The District is surrounded by vineyards and is home to several breweries, but the city’s spirits scene has remained relatively small since the end of prohibition 80 years ago. But that’s about to change. On Saturday, Jan. 10, D.C. is adding another distillery to its list. 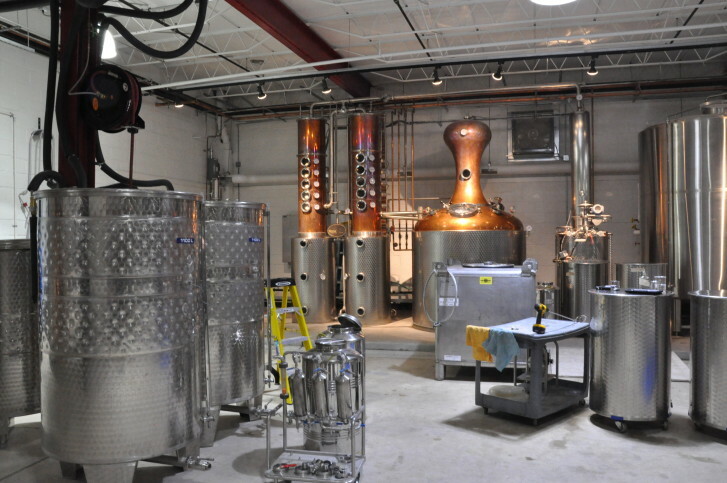 One Eight Distilling will join New Columbia Distillers as the second D.C.-based distillery. One Eight will make and sell vodka, white whiskey, gin and, eventually, an aged bourbon. “There’s a big market here which is very much underserved compared to some other states throughout the U.S. that have quite a few distilleries,” says Alexander Wood, chief executive officer and co-founder of One Eight. Five years ago, Wood — a D.C. resident, lawyer and self-described whiskey fan — never thought that he would one day open a distillery. The name “One Eight” is Wood’s legal nod to the city’s history — Article 1, Section 8 of the Constitution provided for the establishment of the District to serve as the new nation’s capital, he explains. Wood has been working on One Eight for 18 months — studying the ins and outs of distilling, scouting locations and waiting on city permits. His decision to establish the operation in D.C., just a few blocks from Union Market in Northeast, was based on business, since city-based distilleries are permitted to distribute directly to liquor stores, bars and restaurants. Bottles of the alcohol will also be available for purchase at One Eight. “We need to ramp up our production and make sure we’ve got enough supply on hand for ourselves first, but we have a pretty good production capacity, and we expect to begin distributing directly to stores and bars and restaurants by early February,” says Wood, who adds that his motive to establish One Eight in the District was also based on hometown pride. Unlike many other first-time food and beverage establishments, One Eight is not a small-scale startup. It’s already one of the largest distilleries in the area. The operation occupies roughly 12,000 square feet, which includes a 7,500 square-foot production room and a sizable tasting room and bar. Wood plans to make the most of the space by offering tours and tastings to the public on Saturdays from 1 to 4 p.m., private tastings and tours as requested and by hosting private events in the distillery. Head distiller Alex Laufer describes One Eight’s products as “grain to bottle.” Most of the grains used in the distilling process come from Maryland’s Eastern Shore; malted rye is sourced from the Midwest and North Carolina. Eventually, One Eight plans to collect its spent mash and give it to local farmers to use as feed. All of the grain is ground in One Eight’s hammer mill and is sent through pipes to the mash tank, where it cooked. Once the grain cools and a natural enzyme is added, the ingredients are pumped to one of four fermenters, where yeast converts all of the sugars to alcohol. From there, it is pumped to a 2,000-liter hybrid pot still. The spirit is then collected and proofed. “And then depending on the spirit, we can either charcoal-filter or chill-filter, and then it will be ready for bottling,” Laufer says. Can’t wait until Jan. 10 to try what One Eight is making? The distillery is hosting a preview event on Thursday, Jan. 8 (that’s 1/8, by the way) from 7 to 10 p.m. Attendees will get a sneak peek of the distillery, and a vodka and whiskey cash cocktail bar will be available in partnership with Union Kitchen. Editor’s Note: A previous version of this story stated One Eight will be D.C.’s third distillery. This was changed to second distillery.